Firing up the grill after a long excursion on the water is such a pleasant experience. With grilling becoming more and more popular, we can’t wait to explore the available grills for boating. Grilling in open water can be tricky that’s why many boaters choose to leave their grill on the mainland. But when you are bringing many people on a boat trip, a grill can help ensure a great meal on the water. So, should you get a grill for your boat? Chicken, ribs, kebabs, burgers, and hot dogs taste better when they come from your grill. A nice drink is always better when it comes cold form your boat cooler. Grilling is designed to be done in a well-ventilated area that is why we designate it for the backyard typically. Not to mention, grills use either charcoal, propane, or electricity for cooking. For boating, there are lots of considerations to look at before even deciding if a boat grill is for you. You will have to consider the storage space, and how much grilling you plan to do. Remember that you should not grill under the deck awnings or other fabric coverings of your boat. The last thing you want is to start a fire or burn yourself. That’s why safety is imperative when you grill on board your boat. Charcoal grills require that you build a fire and wait for the charcoal briquettes to heat up before you grill. When lit they can sustain a fire through the strongest winds. On the other hand, they are messy to clean up and can be a cause of an emergency if you spill hot coals on the deck of your boat. You will find small stainless steel grills designated for use with charcoal on your boat. These grills are more convenient as they heat up fast and just like a gas stove it is very easy to control the temperature. Since the heat can be turned off immediately they are considered safer than gas grills. They are also easy to clean up. But in a strong breeze, it may be difficult to keep your gas grill lit. These are convenient if you have a consistent source of AC power on your boat. This means having a boat that has its own built-in generator or bringing a generator on-board your boat which is not practical on all boats. What is an infrared boat grill? Infrared cooking is a new technology on the market. It is different than conventional grilling but has been used in backyard barbecues, and is now becoming more common in boat grilling. 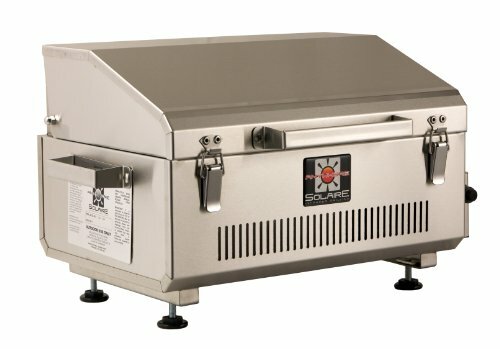 These grills cook food indirectly or through a medium. It can be oil. Water, or air which is heated to a high temperature and then circulated through the grill; much like an air fryer or standard convection oven in your home. There are a variety of mounting options to choose from when deciding where to install your grill. The rod holder mount is a popular choice as it transforms any rod holder to a boat grill mount. Other options include rail or a push-pit that is commonly used by cruisers. The deck socket is also a favorite as they are already installed on most decks or cruising boats for table installation. The size of the grilling surface determines how much food you get to grill at one time. Large grilling surfaces are applicable if you will need to grill food for a large number of guests on-board. 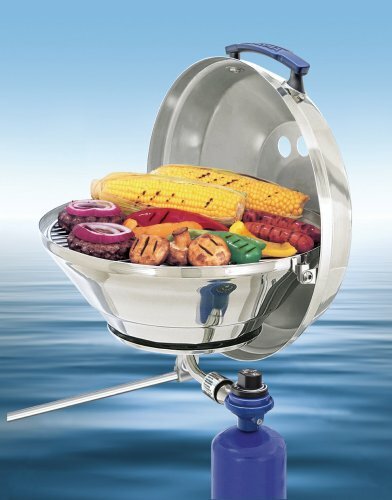 But if you are bringing a few friends, a small boat grill is more suitable, easier to clean, and less expensive. You should opt for a high-quality grill since they are built out of sturdy materials that are resilient to the elements and will last more than one season. Most higher quality boat grills will use double layers of stainless steel on the shell to prevent discoloration and prolong life. A high quality grill is also a must if you plan to take your boat out in the Ocean as the salt water and air is very harsh and cheaper grills may only last one season on water if you are out often and do not clean your grill thoroughly after each outing. You will have to bring the fuel for your boat grill on your excursions. With a gas grill, we are talking about a propane canister or connecting to an LPG or CNG system; which are only on large boats/yachts. Propane canisters are appropriate for onshore grilling as well if you are beaching your boat and taking the grill onshore. The BTU rating on your propane canister will determine how long the canister will last. A one-pound canister will provide roughly an hour of barbecuing when used at the highest setting. It has a rating of 20,000-22,000 BTU. LPG systems can come in the form of disposable 16.4-ounce canisters. They will give you more hours of grilling, but they should always be installed outside where space is well-ventilated. You can also have a propane system installed on your boat to offer convenient grilling any time you need to grill something. The propane tank is stored in a vapor-tight compartment that is separated from the interior of the boat. Again this is a more expensive option found on larger boats and not really appropriate unless you will be doing a lot of grilling on your boat. As we said, safety is the most important factor since you will want to have a nice barbecue without putting you, your visitors, or your the boat in danger. Always grill in an open area above deck. This is because carbon monoxide can accumulate and have lethal results if you use the grill in an enclosed space. Trim excess fat on meat to reduce flare-ups. And, do not forget to bring a spray bottle to eliminate any flare-ups that may occur. Do not always use the highest heat setting on your grill. Mount your grill securely away from areas where it could come into contact with kids and pets or fabric/towels. Never leave your boat grill unattended when it is in use. Do not use any starter fluid other than charcoal starter fluid when firing up a charcoal grill. 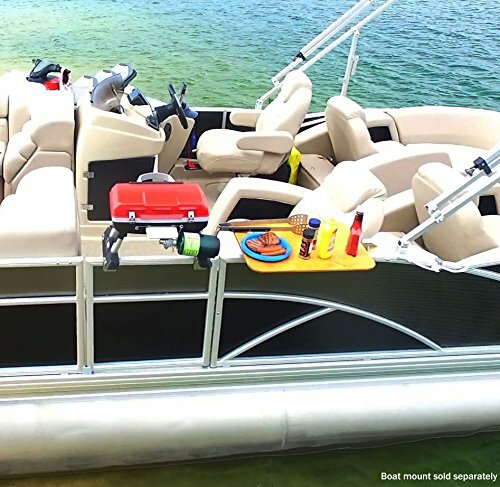 Apart from the boat grill mount, you will also want to bring a grill cover to keep out dust, sand, and water from getting inside and damaging the components of your grill. You will also need a grill brush to clean your grill grates. A nice grilled meal is perhaps the best reason for grilling on board. 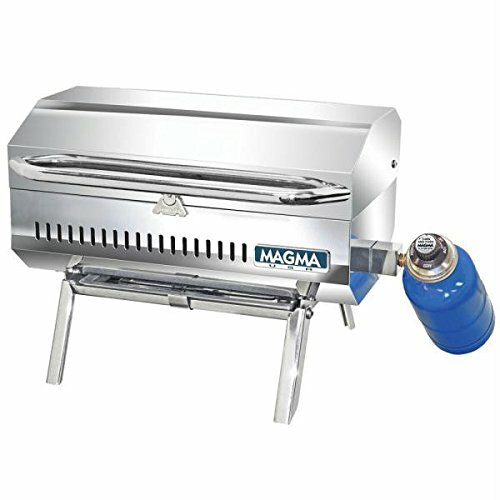 With the Magma A10-803 Connoisseur Series, you have a high-quality gas grill to fulfill your grilling needs. This model is designed with a mirror-polished stainless steel outer shell. This boat grill gives you 162 squares inches of grilling surface. 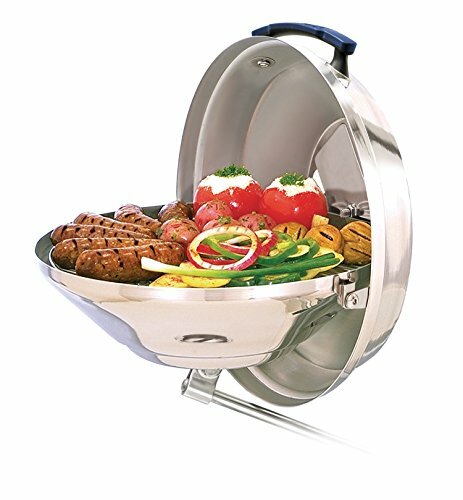 You can use it when you have lots of friends as it will provide you with sufficient room to grill something for everyone. The snap out radiant plate is a thoughtful feature as it allows for even heat distribution to get your food crispy on the outside and juicy on the inside. When it comes to cleaning, you will be working with three grill grates and the grease plate that are all removable. With the full-size handle, you can access this grill from whichever side you prefer. 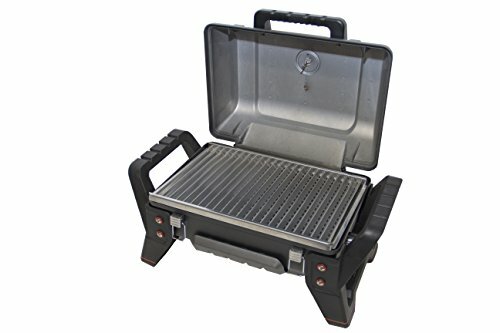 It comes with folding legs that can be folded away when you want to mount the grill on board, but you can still use it for onshore grilling when needed. It can use a propane canister or connect to LPG and CNG systems. Also made of mirror-polished stainless steel, the Magma Marine Kettle Gas Grill is a sight to behold. It is a small size model that will be your best bet for feeding your friends and family on board. It has a lustrous look that shows its high quality. This gas grill is designed with a radiant heating plate that uses convection cooking and radiant waves to heat and cook the food like a conventional grill. It can use a one-pound propane canister, or you can connect it to an LPG or CNG system. It will consume less fuel while distributing the heat evenly. This allows the grill to achieve hot temperatures that will cook the food faster giving you memorable meals for everyone to enjoy. It boasts a swiveling, windproof control valve and turbo venturi. The fuel valve is in a safe and convenient position to eliminate blowouts. With the help of the hinged lid, it can be rotated to shield the flame in high wind conditions. The cover stays cool even when in use and is spring loaded so it will not slam down. 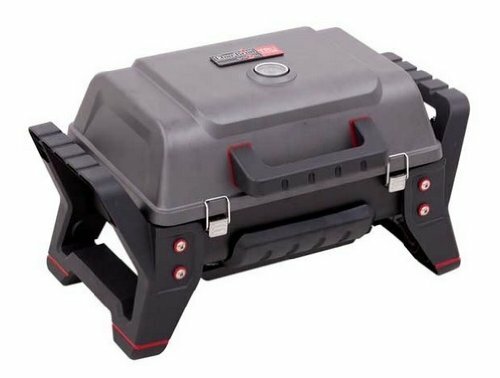 What’s more, this gas grill has a grease catch pan that makes cleaning it very easy. 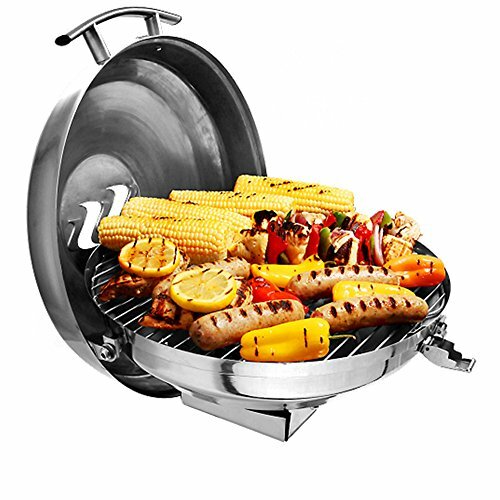 If you are looking for a boat grill that preserves the flavor of food in the traditional sense, you will love the concept of the Magma Products Marine Kettle Grill. It boasts faster cooking than almost all other grills this size. This unit has an adjustable height grill grate so that you can cook at the proper height for different types of food. It allows you to obtain the exact results that you would expect to see in a barbecue. The variable draft door assembly is a nice feature since it provides superior temperature control. You will never risk burning or under cooking food since you will always know the temperature it is at for even cooking. The hinged lid is also balanced so that it will not close on you in windy conditions. Better still, you have a heat resistant plastic handle. This will help prevent you from burning yourself and ensure a safer grilling environment. All the components including the lower charcoal grate and the sealed ash compartment are effortless to remove and clean. You will be able to clean this grill with soapy water and a wire brush. It is recommended to wash it while it is still warm for faster cleaning. If you are looking for a model with an affordable price tag,the Smoke Hollow 205 is the way to go. 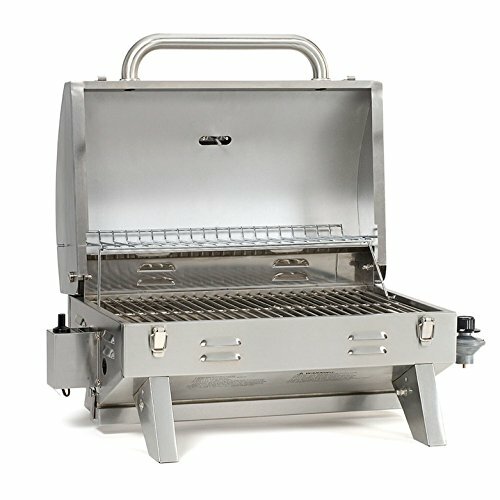 This boat grill features stainless steel parts that will not rust and is a portable model that will be easy to install and uninstall if needed. The Smoke Hollow 205 is a sought after pontoon boat grill. This is because it is fast to mount on a rail as well as being able to reach high temperatures of up to 500F. It provides you with the opportunity to grill lots of different types of food. It has a wide cooking surface that is 205 square inches and a 105 sq.in chrome-plated warming rack. It provides excellent functionality since you can use it for cooking large amounts of food while keeping already cooked food warm. This model favors quality at a great price. It has a stainless steel U burner and stainless steel wire lid and drip tray. It is very easy to clean and take care of the components. With the carry handle and folding legs, it will be fast and easy to transport to almost all your outdoor and boating adventures. The Kuuma Marine Charcoal grill is built to withstand the harsh marine environment. It is built of 300 series stainless steel that is rust and corrosion proof. This unit uses charcoal so you won’t have a problem keeping it lit on windy days. It comes fully assembled. You only need to prepare the fire, and you can start grilling right away. It has a 160 sq.in cooking surface making it ideal for a barbecue with a group of up to five. This boat grill can be easily mounted using a Kuuma rail, pedestal or rail mount. It comes with a stay cool handle as well as a latching lid and a removable liner. The liner comes in handy to prevent high-heat discoloration of the cover. 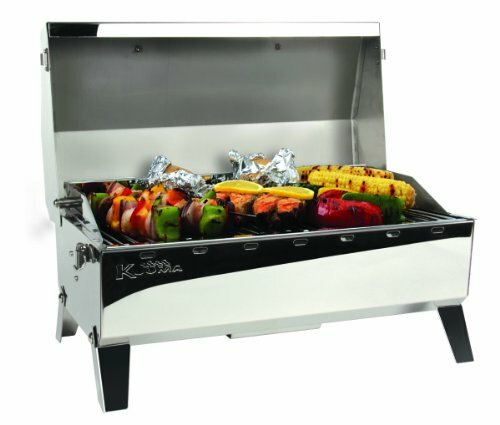 You will love the convenience brought about by the folding legs since you can use the grill on a flat surface as well. You don’t have to be on a boat to enjoy the convenience of this charcoal grill. A tabletop boat grill like the Cuisinart Petite Gourmet Grill is the perfect addition to a small pontoon boat. The Cuisinart CGG-180T provides you with the convenience of portability when you want to use it in small spaces. The one downside is that there is a limited grilling area so it is not ideal for large groups or boats. The cooking surface of 145 sq.in. is adequate but again not intended for cooking for a lot of people at once. With the powerful 5,500 BTU burner, you will have high temperatures and even cooking. In fact, you will have enough for a small to medium-sized family. The aluminum legs set up in a moment’s notice. They are well-balanced so that they are stable on just about any surface. You also get an integrated lid that locks securely during transport. With the briefcase style, it is easy to transport, and very light. This model is designed to provide quick searing and warming of your foods. It also has a grease catcher for simple clean up. When it comes to infrared cooking, Char-Broil Grill2Go X200 is a serious contender of the best boat grill. This is an infrared grill that is powered by a 16.4-ounce propane cylinder. It is easy to transport the cylinder thanks to its lightweight. The TRU-infrared cooking system is perhaps the best when it comes to locking in juices and preventing flare-ups. This way, you can cook great food without the mess. 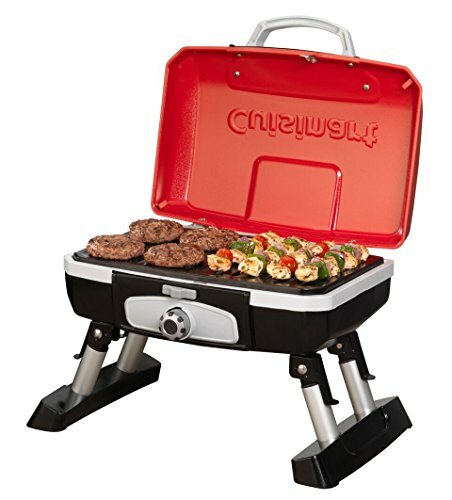 It uses a cast aluminum firebox, and there’s a temp gauge so you know when you reach the ideal temperature for grilling your food. You also get stainless steel latches to secure the lid. This unit has sturdy legs that can withstand wind and a bit of turbulence. However, we always urge that if you are not going to mount your grill, then it is better to use when the boat is docked or onshore. Solaire Anywhere is a luxurious free standing boat grill that can be mounted on a boat. It uses advanced infrared technology to provide high heat, unlike traditional grills that cannot attain the ideal temperatures for superior cooking. With the Solaire Infrared Grill, food can cook fast and evenly while retaining all the flavors provided by charcoal grills. It brings consistency and the ability to control the temperature so that delicate food will not overcook or burn in the process. It has V-shaped grates that reduce flare-ups. The drippings incinerate and go up in smoke adding the smoke flavor to your food. You will also like that it ignites efficiently using a push button that utilizes one AAA battery. This model is made of 316 stainless steel and has seamless welding for improved longevity. It runs on one-pound propane canisters but can be adapted for natural gas or 20-pound propane tanks if desired. The Camco Kuuma Kettle Gas grill is designed for marine use. It is built to be wind resistant to provide even and cooking no matter what kind of food you are grilling. This kettle grill comes with a Balanced Port Velocity Burning System. It is the secret behind the well-rounded cooking as well as the wind resistance. What’s more, it has a lift-and-clean liner that prevents grease build up and reduces flare-ups. You will like how easy it is to clean the surface because of the stainless steel parts. The grilling grate and the heat plate are removable to facilitate cleaning of all the components easily and quickly; which is nice after a long day on your boat. 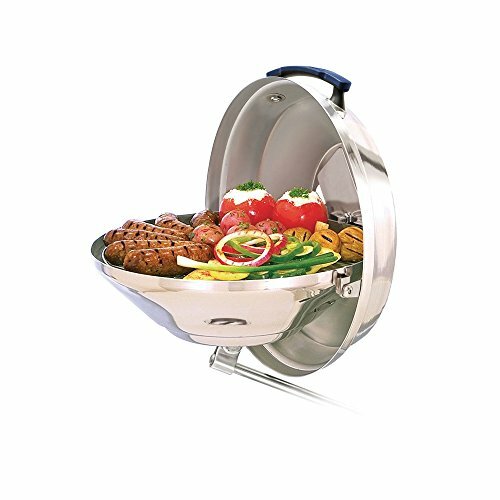 It has a handle that stays cool all through the cooking to make it easy to handle food and the grill when it is hot. The lid latches completely to keep the components of the grill secure during transport. You can mount this grill using a rod or pedestal mount. Also, you can opt for the leg base when you want a tabletop configuration. 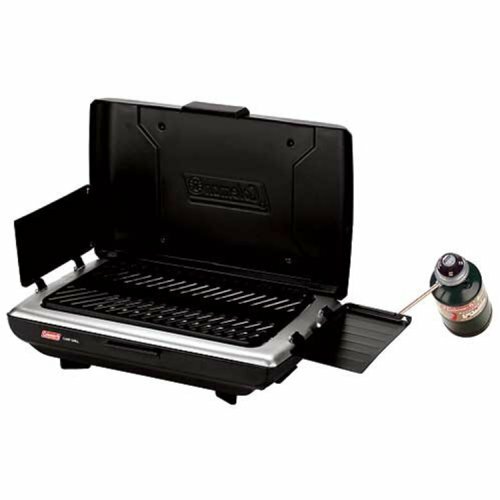 The Coleman Camp Propane Grill has always come up as one of the best portable models. 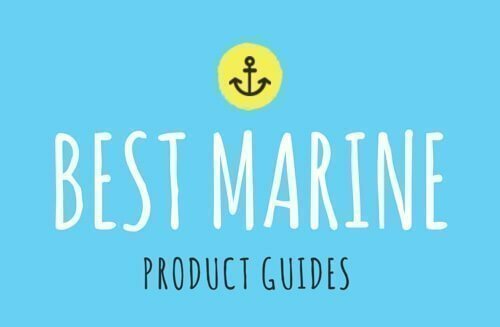 It is no wonder why many people recommend it for use on a boat. You can enjoy hassle-free barbecuing with a creatively designed grill. This model utilizes Perfectheat Technology complemented by a 10,000 BTU burner. It is a sure pick for even cooking and efficiency in outdoor cooking. You will not use too much fuel to get your ribs and chicken thighs seared to perfection. With the help of the wind block panels, it will not be difficult to keep this grill lit in windy conditions. It has a porcelain-coated grate to make cleaning straightforward. Better still, you will also get a removable grease tray to catch all the drippings and keep the rest of the grill in excellent condition. The cooking area is also large which will provide enough room to cook a handful of burgers and steak without crowding. This way, you will have enough space to turn your meat and cook it to everyone's preferred temperature. The grate heats up to extremely high temperatures on the highest setting. It will be great if you only used the low setting for most foods. Nothing beats a nice day out on the water with a grill to feast on your catch and other favorite foods. With one of these boat grills you can have a memorable experience on every boating excursion. We highly recommend the Magma A10-803 as our top pick. It uses a radiant plate to preserve flavors of a traditional grill. It is easy to mount and clean as well. If Magma A10-803 is not a perfect choice for you, we believe you can find the ideal model from one of our other categories. Don’t wish for a good boat grill, go get yours today!